Banchan is traditionally made days in advance and it’s incorporated into every Korean meal. Make these small side dishes ahead of time and add a side of rice or an easy soup bowl recipe throughout the week and plan your meals efficiently. The shishito peppers only need a few simple ingredients (oil, soy sauce, garlic, and salt) to make them shine! 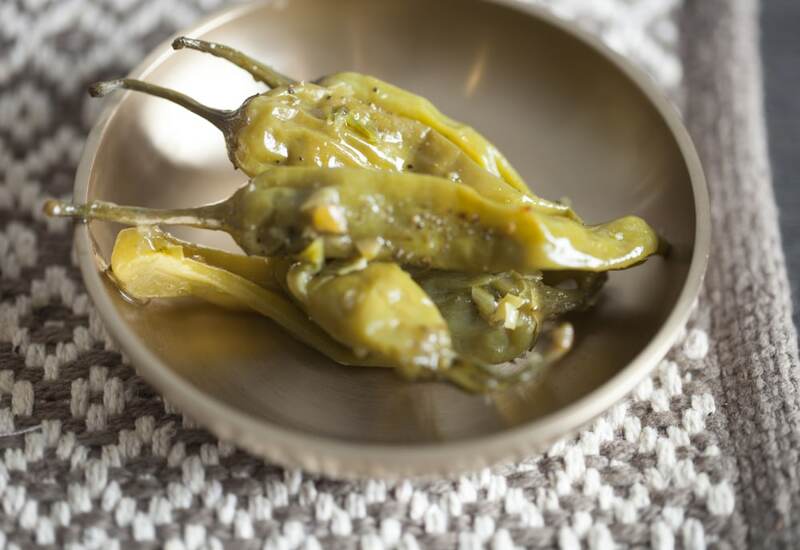 Shisito peppers are a sweet, East Asian variety of pepper. They are slender, finger-sized bright green peppers with long creases in the body of the fruit. Their flavor is lively and sweet with a hint of smokiness. You can purchase Korean ingredients in Asian and Korean markets and in online stores. Make these side dishes ahead of time and store them in the refrigerator to enjoy throughout the week. Per Serving: 92 calories; 8g fat; 4.9g carbohydrates; 1g protein; 0mg cholesterol; 353mg sodium. These were super easy to make! They're good as a regular side dish. Great shishito recipe! This is very differently made than what I've seen before. I'm confused... I am looking at the ingredients for Korean Braised Shisito Peppers Banchan Side Dish, but the directions are for a cucumber dish. I would love to have the correct instructions because this seems like something I would really enjoy.